I introduced the East Boston YMCA’s experience with the BPS Opening the World of Learning (OWL)/Building Blocks curriculum in the first post in this series. In the second, I discussed the impact of longer, more structured units, multiple and multi-purpose read-alouds of stories, and a robust math curriculum. Today I conclude the series by describing the use of small-group activities and independent centers as well as changes in classroom management, teacher confidence, and the development of oral language and thinking skills. 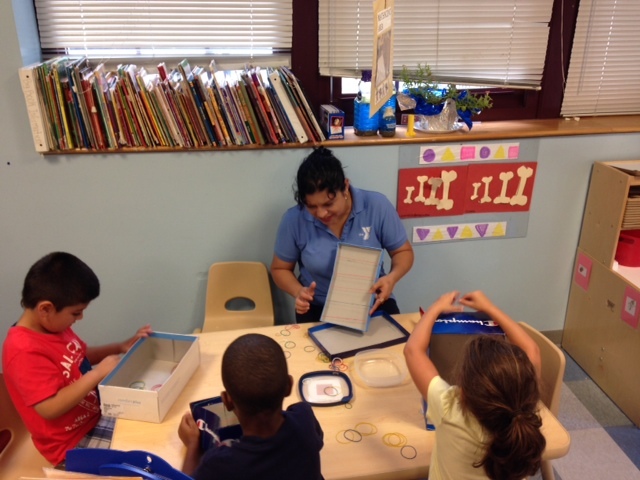 In last week’s post, I began describing the East Boston YMCA’s experience implementing the Boston Public School’s prekindergarten classroom, introducing the range of changes that the new curriculum has brought about. This week I discuss the impact of longer, more structured units that emphasize multiple and multi-purpose read-alouds of stories and a robust math curriculum aligned to the developmental learning trajectories of 4-year olds. How does classroom practice change as a result of Birth-Third work? How do children, teachers, and leaders experience these changes? Having summarized the strategies of the first five Birth-Third Alignment Partnerships in Massachusetts (Boston, Lowell, Pittsfield, Somerville, and Springfield), I am now posting an occasional series of articles describing the on-the-ground experience of implementing these strategies. I began these profiles of direct service by describing teacher professional development in Lowell’s Communities of Practice for family child care and center-based preschool teachers. Future posts will cover home visits in Pittsfield and literacy coaching in Somerville. This week I begin a series of three posts that examine the experience of implementing a new preschool curriculum from the vantage point of two teachers and the program director at the East Boston YMCA. For this series I’m trying out a new blogging platform called Medium. When you click on the link below, a new tab will open in Medium with the first post on the East Boston YMCA. Medium provides an attractive environment for article-length posts and photos. The type is clean and big, and it’s a distraction-free place to read. There are no sidebars with links inviting you to go somewhere else. Medium also has improved notes and commenting capabilities. Click on the discreet numbers to the right of paragraphs for notes from me (like footnotes) or from other readers. You do not have to sign in to read posts, but if you sign in using your Twitter or Facebook account, you can comment on paragraphs or even sentences or words. Nothing will be posted to your account unless you want it posted. Click the plus sign (+) to the right of a paragraph (or highlight text and click the plus sign) to add comments. I welcome your comments on the posts, and let me know what you think of Medium via comment or email.